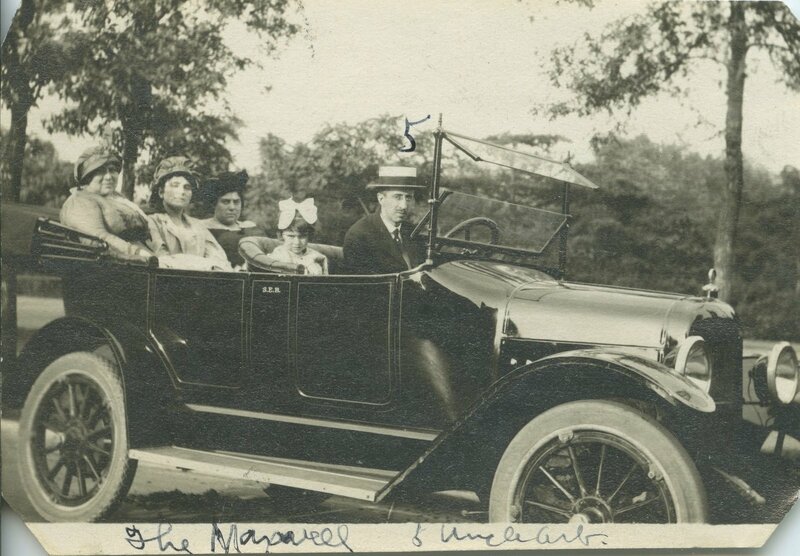 This is a picture of my great grandmother Rona riding with some cousins and “Uncle Art” in her father’s circa 1909 Maxwell motorcar. She’s the little one with the giant bow and the rather unhappy expression; Uncle Art is the one with the “5” over his head, which corresponds with the little key in the caption below that tells us that this is “The Maxwell” and “5 Uncle Art.” No names for anyone else are supplied, which is too bad, because I have absolutely no idea who they or Uncle Art are, because as far as I know, neither Rona nor her parents had any uncles named Art. The only Art I know of was not an uncle, but a first cousin by marriage. But I don’t think this is him (that cousin, Arthur S. Leppel), because on further inspection, this man doesn’t look like a first cousin by marriage, but a flesh and blood Brown relation. And the fact that he is probably a flesh and blood Brown relation is probably the reason why I don’t know who he is. Why? Because searching for Browns in the city of Chicago is like searching for Cohens in New York City: very difficult and almost endless. So unless Rona’s brother, my great-great-uncle whose 98th birthday fast approaches, can tell me who Uncle Art is, I have very little hope that I will ever be able to figure that one out. But back to the car, which seems to be the reason that this picture was probably taken. It’s an awfully nice one and my great-great-grandfather Sam was obviously quite proud of owning it – note his initials “S.E.B.” on the passenger door. And let’s also take into account that the caption of the photograph is “The Maxwell” — not “Rona and Uncle Art in the Maxwell” or any combination thereof. I have a couple of other pictures of Sam and his family with various automobiles, so I have to guess that – like most of his male descendants – he was a guy who really liked cars. If all my cars were this fancy and monogrammed with my initials, I’d take a lot of pictures with them too. Obviously Nonie was somewhat close with Uncle Art — she is sitting in the front seat instead of between the other women, who probably would have preferred to have her back there, for her safety…Art was a cool guy. And he is definitely a Brown. He looks uncannily like Uncle Stanley. I hope you get a chance to show him this picture. Keep us posted..